Mare Pineta (Baia Sistana) is the perfect campsite for families and travellers looking to relax, explore and indulge in the coastal waters of the Mediterranean Sea. The luxury camping site is ideally placed to explore the enchanting city of Trieste near the Slovenian border, just 20 km away. 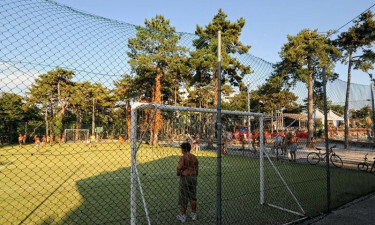 With plenty of attractions and activities to enjoy in the area, Mare Pineta offers an Italian camping holiday for all the family to remember. 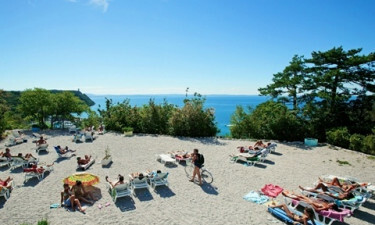 Located in Duino, Mare Pineta offers unique views of the coastal waters with direct access to a stony beach. Mare Pineta is set along a beautiful protected coastline on the Rilke trail, a flora and fauna abundant path with spectacular Sistiana Bay views leading to Duino Castle. There are numerous activities for the family to enjoy nearby. With mobile home accommodation close to the beach, sports and pool, book your next luxury camping stay at Mare Pineta through LuxCamp. Why choose Camping Mare Pineta? Mini-club and playgrounds for children. 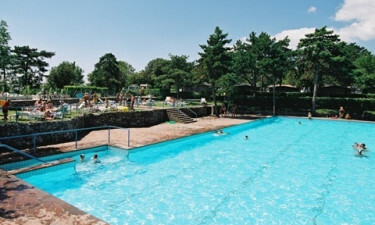 The swimming pools of Mare Pineta are fun for all the family. With a solarium and panoramic views of the Gulf of Trieste, this is the perfect place to unwind. Children can enjoy the paddling areas and serious swimmers can relish in a large pool for their daily laps. There are plenty of sun loungers for you to relax by the pool. With direct access to a coastal promenade, you can enjoy the stony shoreline within 200 m from your campsite. The surrounding coastal areas offer crystal clear waters and activities from scuba diving to boat trips. There are many coastal paths and trips to enjoy to nearby fishing towns and seafood restaurants.